The folks at Michaelangelo Gallery have an eye for fantastic artistic talent. For the past 25 years, Angelo Grova’s gallery has been a creative catalyst for hundreds of local and guest artists at all stages of their art careers. 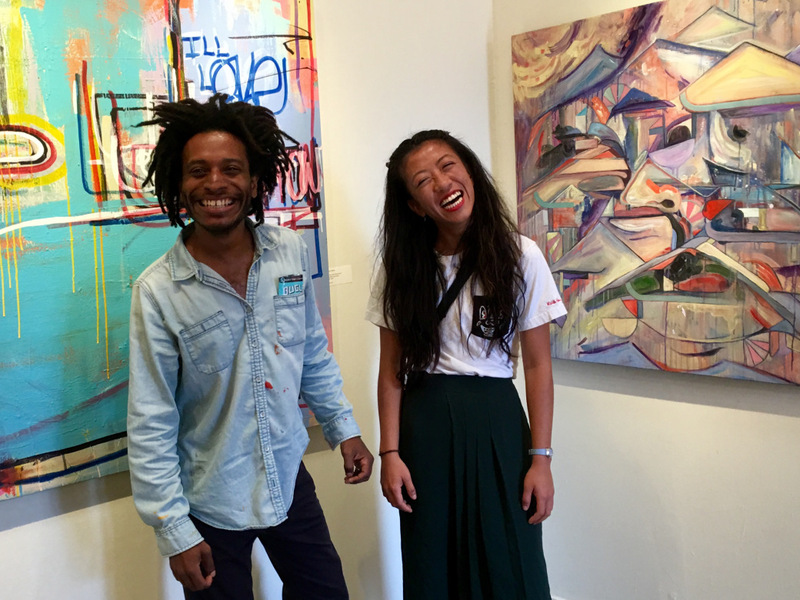 In the spotlight are two emerging painters to keep on your radar: Nicole Shek and Joel Clifton. 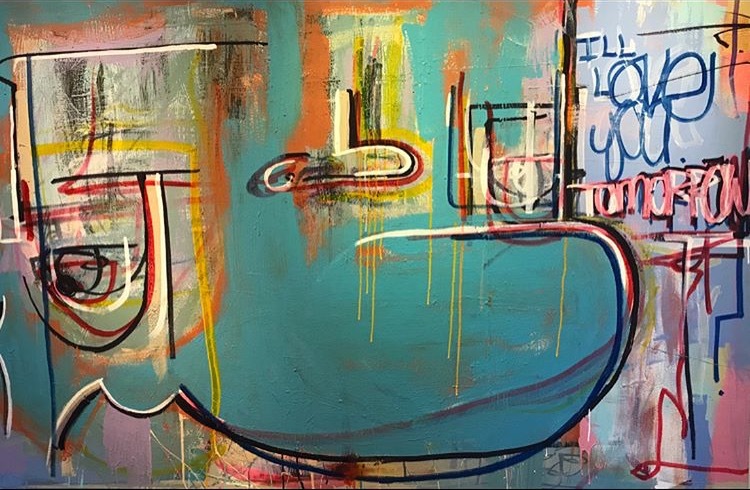 Michelangelo Gallery is currently hosting “It Takes Two”, a collaborative exhibit of paintings by Nicole and Joel. 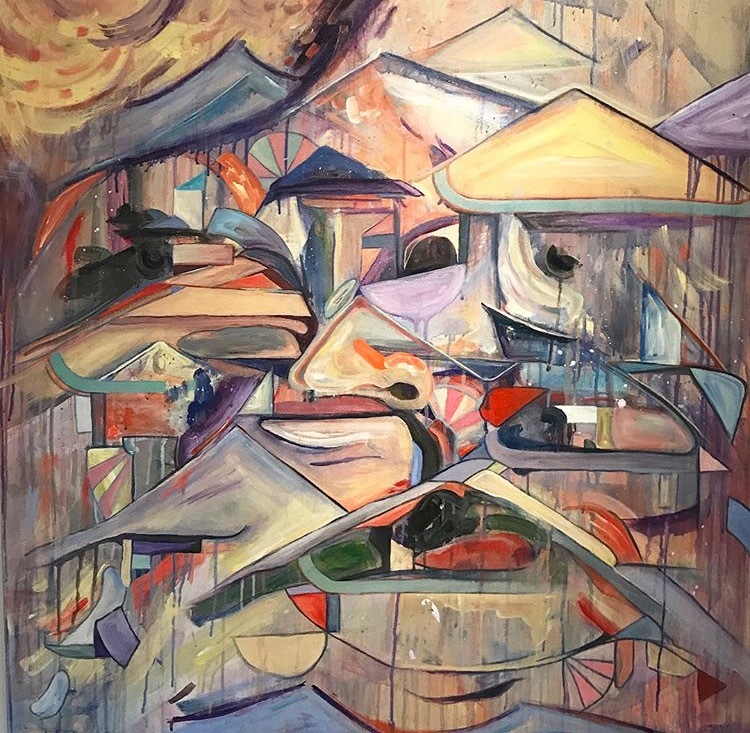 The two artists have worked together to create vibrant, bold paintings based on facial images and inspired by life experiences and individual messages. Come “face to face” with the paintings and artists this Saturday at their Artist Talk, catch the exhibit through August 27, and keep following these painters as their work develops. In the mean time, read on to hear more about the art from Nicole and Joel. Local Santa Cruz: What inspires your paintings and artwork? Nicole: Creating has always been a therapeutic activity for me and something I absolutely feel the need to do; a way to release my emotions without inhibitions. I’m inspired by people and their experiences, the spontaneity of life, and the interconnectedness of all things. I’m inspired by feelings that can’t easily be put into words and am a believer of the abstract. I’d say my biggest influences are Picasso, Matisse, and psychedelic art. Joel: Many things inspire my art, from music, politics, relationships, and friends, to everyday life. How has Santa Cruz influenced your lives and creativity? Nicole: Santa Cruz has been the easy going, open minded place that has allowed me to truly thrive and be myself. It has instilled in me values of creativity, community, love for nature and the ocean, and compassion. People here are passionate, love life, and appreciate the beauty and people that surround us. There’s really no place quite like Santa Cruz. Joel: Living in Santa Cruz has been awesome. I really found myself in SC. I found love and heartbreak here; I have bled, laughed, cried, and gotten to know great people here. I have tried new things and really expanded my mind. I made friends and enemies in the Santa Cruz community. I won and lost here. But it all made me who I am and I found my passion with painting which is very rare, so I’m going to take full advantage of that! What has it been like collaborating on the “It Takes Two” exhibit at Michelangelo Gallery? Nicole: “It Takes Two” was an event in time that really came at a unique, opportune moment. Joel and I met at 17th Avenue Studios; we were in building 4, the “Quonset Hut”, and he had moved into the studio just a few footsteps away from me. We immediately connected and started collaborating on paintings. We both felt that meeting each other had been a rare treat; to meet a fellow young artist of color who was passionate about their work and who we really connected with on many levels. Both having a great passion for art and life, we pushed each other to our absolute limits! From that, we explored, laughed, cried, yelled, created, and painted – a total rollercoaster ride; and it was a blast! Joel: “It Takes Two” was named by the curator of Michelangelo Gallery, Kat Moseley. She has been a great inspiration and she pushed me to work harder and made me realize what my potential is and can be. She gave me advice and helped me so much. I am so thankful for that. Nicole and I randomly went into the gallery on a Saturday just to check it out. We presented ourselves to Kat as emerging artists and she saw something in us. She took us under her wing and made sure we had our work together before she granted us the opportunity to show at the gallery. I thank you Kat! The collaboration came naturally between Nicole and I. When we met at 17th Ave Studios we clicked instantly. I knew I wanted to paint with her and was on a mission to get our paintings in a gallery. I needed our work to be seen by the public. Our friends came by the studio, saw what we were doing, liked what they saw, and pushed us to keep going. By working extremely hard, not going out, and basically being shut in from the outside world, we created pieces that people can enjoy and relate to. How do you see your work evolving over time – Do you want to stay with painting or explore other mediums? Nicole: Preparing for this show has pushed my work far beyond my past expectations and has been a completely liberating experience as an artist who had felt lost before. I started doing photography and graphic design growing up in San Jose. Then I delved into the finer side of arts at UCSC, focusing on printmaking and analog photography. Without the resources at the tip of my fingers; this past year, I found a love for painting. I’ve really enjoyed the experience of making these larger scaled paintings, and plan to continue doing so while combining the other mediums that I love! Joel: I love painting! I never knew what that type of love was until I found painting. With any relationship you like it one day and hate it the next, but at a certain point you get addicted and you can’t leave it even if you tried. And when you are away from it, you start to miss it and can’t wait to get back to it. I found that with painting and being in the studio. It hurts me when I can’t paint, it definitely filled a void in my life that was missing. My advice to people is to find that one thing that you like to do and go for it all the way! Follow your dreams because it will pay off, and filling that void is one of the greatest joys life can offer. I would like a “Joel Face” to be recognized in the art community. In the near future, my messages are going to be deeper and the colors are really going to pack a punch. I can’t wait for the public to see the second run of my paintings. I have a bunch of ideas already brewing in my head. Meet these inspiring artists and hear more about “It Takes Two”: Artist Talk: Saturday, August 19, 2017 from 4pm to 5pm, Michaelangelo Gallery.